Wall Street Breakfast: Next Steps In Brexit Saga? Sterling is up 0.3% to $1.3272 as U.K. lawmakers voted to delay Britain's departure from the EU, sending Theresa May back to Brussels to request an extension. Her pact with the trading bloc is also expected to be voted on in the House of Commons for a third time next week, after being soundly rejected twice. Parliament further blocked a motion yesterday seeking a second Brexit referendum, though Labour leader Jeremy Corbyn said his team is still working on plans for another public vote. 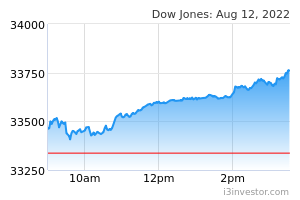 This week has so far seen a 500-point rise in the DJIA, and futures are tagging on another 80 points to the index. It's also been a big week for the S&P 500 and Nasdaq, with both pointing to gains of 0.4% at the open. Chinese state media reported overnight that Washington and Beijing were making "concrete progress" on the text of their trade pact, while President Trump said Beijing has been "very responsible and very reasonable" in their talks. Asian equities also finished the week on a strong note, with the Nikkei closing up 0.8% and Shanghai 1% higher, as Chinese Premier Li Keqiang wrapped up the National People's Congress in Beijing. He said the country will stick to its current economic support strategy as it faces new pressures on growth. A dovish view was also seen in Japan, as the BOJ left its monetary stimulus program unchanged after downgrading its assessment of exports, factory output and overseas economies. Italy is considering borrowing from China's Asian Infrastructure Investment Bank as part of plans to become the first G7 country to endorse Beijing's controversial "Belt and Road Initiative." An MoU will likely be signed on March 22. Until now, the majority of BRI infrastructure loans have come from the China Development Bank and the Export-Import Bank of China, but the AIIB lends according to international standards required inside the EU. A nationwide power failure in Venezuela could trigger "serious disruption" to the oil market, according to the IEA, but OPEC kingpin Saudi Arabia should have the means to offset any further production woes in Caracas. Until recently, the IEA said Venezuela's oil production had stabilized at around 1.2M barrels per day. That's also the size of the output cuts agreed by OPEC countries and some non-OPEC producers. The SEC is suing Volkswagen and its former CEO Martin Winterkorn over Dieselgate, accusing the automaker of perpetrating a "massive fraud" on U.S. investors. According to the agency, VW (OTCPK:VWAGY) issued more than $13B in bonds and asset-backed securities in U.S. markets from April 2014 to May 2015, even though senior executives knew that over 500K U.S. diesel vehicles grossly exceeded emissions limits. Volkswagen responded by saying the SEC was "piling on" and the complaint was "legally and factually flawed." Completing the EV lineup that Elon Musk has dubbed "S3XY," Tesla (NASDAQ:TSLA) took the wraps off its Model Y, with prices starting at $39,000. The crossover is larger than the entry-level Model 3 but smaller than the Model X, Tesla's full-size SUV. With a 0-to-60 mph acceleration time of 3.5 seconds and a standard range of 230 miles, the first Model Ys are due for release in fall 2020. Boeing investors are rushing into derivatives markets to protect themselves from further steep falls in the company’s share price as analysts struggle to assess the financial fallout from two deadly crashes of the 737 MAX in five months. The sale of puts soared to 237,000 contracts on Tuesday - 20x the average daily volume - and has remained elevated since. At the same time, the cost of hedging against a further 10% fall in Boeing (NYSE:BA) shares has close to doubled. General Electric shares rose nearly 3% yesterday after CEO Larry Culp announced 2019 would be a "reset" year and promised improved performance in terms of earnings from 2020 and beyond. GE expects free cash flow for its power business to remain negative in 2020 before turning positive in 2021, and sees free cash flow for all its industrial business between breaking even and negative $2B before turning positive in 2020, while the pace of improvement accelerates in 2021. Two key lieutenants to Mark Zuckerberg are out at Facebook (NASDAQ:FB) within a year of their reassignment to new roles, pushing FB shares down 1.7% premarket. Chief Product Officer Chris Cox played an integral role in Facebook's development, starting as an engineer on the original News Feed and most recently determining strategy for the company's family of apps. Chris Daniels, who ran the business development team and WhatsApp, will also be leaving. Spring cleaning? Goldman Sachs (NYSE:GS) laid off 65 employees in its New York office at the end of February, according to a notice filed with the state Department of Labor. The body count, however, is expected to swell in the coming weeks, according to the New York Post. The layoffs have been closely watched on Wall Street for hints about what direction will be taken by new Goldman CEO David Solomon, who took the reins from Lloyd Blankfein last October. The U.S. is considering sanctions that would essentially ban Visa (NYSE:V), Mastercard (NYSE:MA) and other financial institutions from processing transactions in Venezuela, Bloomberg reports. The move could potentially affect oil, power and agricultural companies that conduct business in the country, such as Cargill, American Airlines (NASDAQ:AAL), General Electric (NYSE:GE) and their local contractors. It's been a week of outages for some of the most popular tech services, although evidence at this point indicates that the online disruptions were unrelated. Verizon (NYSE:VZ) experienced an outage on Tuesday morning, followed by a Gmail (GOOG, GOOGL) and YouTube issue on Tuesday night, while a "server configuration change" took down Facebook (FB) and Instagram for hours on Wednesday. Apple (NASDAQ:AAPL) joined the party yesterday, with virtually every iCloud service experiencing problems, including Contacts, Drive and Mail. Huawei has built its own operating system for smartphones and computers in case it's suddenly blocked from using U.S. software from Microsoft (NASDAQ:MSFT) and Google (GOOG, GOOGL), the Chinese company confirmed to CNBC. The Chinese telecom equipment supplier has also made a big play in semiconductors and now designs its own chips for its smartphones, however, some of its laptops still use American components from companies like Intel (NASDAQ:INTC). The rhetoric is heating up between Apple (AAPL) and Spotify (NYSE:SPOT). "Spotify wouldn’t be the business they are today without the App Store ecosystem, but now they’re leveraging their scale to avoid contributing to maintaining that ecosystem for the next generation of app entrepreneurs. We think that's wrong," Apple said in a statement. Spotify's complaint with the EU, filed earlier this week, centers around a 30% fee Apple charges most in-app purchases made through the App Store. Spotify says the costs make it impossible to keep its prices competitive with Apple Music. U.S. Federal Judge Gonzalo Curiel has also issued a preliminary ruling that Qualcomm (NASDAQ:QCOM) owes Apple (AAPL) nearly $1B in patent royalty rebate payments, though Qualcomm is unlikely to write a check to Apple because of other developments. The trial in their long-running dispute begins next month, centering around a complex cooperation agreement of patent licensing practices, reimbursements and deals not to attack each other in court or with regulators. Adobe (NASDAQ:ADBE) -2.5% AH amid downside guidance. Broadcom (NASDAQ:AVGO) +4.8% AH seeing improving industry demand. Dollar General (NYSE:DG) -7.5% after margins disappointed. Oracle (NYSE:ORCL) -3.2% AH on a weaker-than-expected outlook. Ulta Beauty (NASDAQ:ULTA) +3.5% AH posting strong Q4 sales. In Asia, Japan +0.8%. Hong Kong +0.6%. China +1%. India +0.7%. In Europe, at midday, London +0.6%. Paris +0.5%. Frankfurt +0.3%. Futures at 6:20, Dow +0.3%. S&P +0.4%. Nasdaq +0.4%. Crude +0.2% to $58.74. Gold +0.6% to $1302.20. Bitcoin +0.6% to $3864.